How to calculate the video size? What is the difference between MB and MiB? Is this video space calculator accurate? This video file size calculator helps you estimate how much space a video takes on your disk. All you need to do is select the video and compression format, determine the video length, and choose the frame rate of your file. 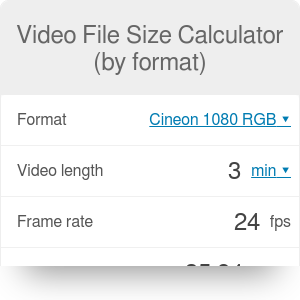 If you're not familiar with video formats, though, make sure to check out our video frame size calculator which finds the video size of an uncompressed file basing on the resolution and color depth. Every video comprises of a series of still images, presented one after another, to create a moving picture. These still images are called video frames. Each frame is shown on the screen for a very short time (for example, 1/24 of a second), what makes the images appear to blend together. where N is the number of frames in a video. The file size is expressed in data size units, such as bytes, kilobytes, or megabytes. If you're not an expert on data size, you are probably perplexed by the conversion between different units. You've undoubtedly heard two contradictory stories. In the first version, one kilobyte is an equivalent of 1000 bytes, and in the second - of 1024 bytes. Which one is true? Before we answer this question, let's clarify what a unit prefix is. It is the word that stands just before the unit name - for example, kilo- or mega-. Each prefix has a fixed numerical value: for instance, kilo- refers to a thousand (so one kilogram is equal to a thousand grams) and mega- refers to a million (so one megapixel consists of a million pixels). The whole confusion stems from mixing up two types of unit prefixes: metric and binary. Metric prefixes always have a numerical value of 10ⁿ (so 10, 100, 1000 and so on). You surely know them: milli-, centi-, kilo-, mega-, and giga- are all metric prefixes. On the other hand, binary unit prefixes have a numerical value expressed as a power of two. These are not popular, which means you might not have heard about prefixes such as kibi- or mebi-. One kibibyte (KiB for short) is an equivalent of 1024 bytes, and one mebibyte (MiB) is the same as 1024² bytes. So what does it mean for our video file size calculator? When you're using regular metric prefixes and talk about megabytes (MB) or gigabytes (GB), you should be using the 1000-multipliers. When, on the other hand, you'd like to use kibibytes (KiB) or mebibytes (MiB), you should apply the 1024-multipliers. Another question you might be asking now is about the accuracy of this video file size calculator. Unfortunately, it is not 100% accurate - the actual video size will differ a bit from our computation. Still, you can use this video space calculator to give you an approximate prediction of how much space your new video will occupy on the hard drive. If you need some more video editing tools, head straight to our timecode calculator! Video File Size Calculator (by format) can be embedded on your website to enrich the content you wrote and make it easier for your visitors to understand your message.